You are here: Home / Geologic Hiking Guides / Why Are There So Many Arches in Utah? Regional joint patterns of Zion National Park in southwestern Utah. Stars show locations of Kolob Arch and the Great Arch. Natural arches form in a variety of rock types such as limestone, shale, granite, or even basalt. However, in Utah, sandstone is the most common geological substrate for their formation. Several of Utah’s sandstone bedrock units meet the favorable conditions of being strong enough to support the weight of large natural arches, yet soft enough to be easily eroded by the natural processes of wind, water, and gravity. The region’s semiarid climate also plays an important role in forming and maintaining the needed exposures of these sandstone units. Because of sandstone’s unique permeability and porosity (the ability of water to flow through its pore spaces), a climate that is too wet tends to destroy sandstone’s ability to form cliffs by allowing groundwater to leach out too much of the mineral cement that holds the sand grains together. On the other hand, a climate that is too dry will not sustain the perennial streams responsible for the effective development of cliffs and canyons where arches most often form. GoogleEarth™ oblique aerial view of the parallel joint pattern formed in the Entrada Sandstone near Arches National Park in southeastern Utah. 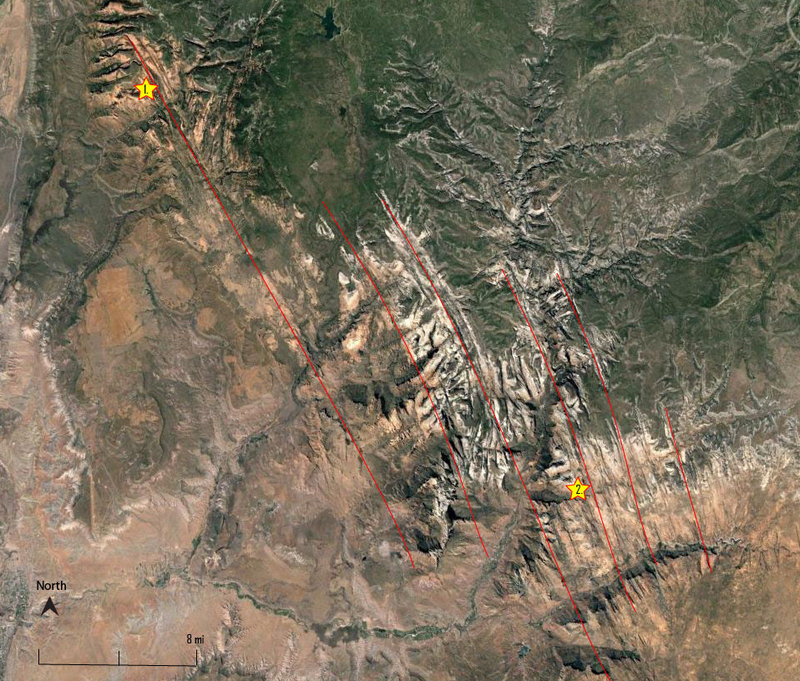 The axis of the Moab Valley anticline runs along the left side of the image. Arch formation in Utah is facilitated by an abundance of regional, parallel joint systems or sequences of bedrock fractures. These joint systems tend to be located on the flanks of broad, gently sloping uplifts or folds. For instance, the fins of rock that host most of the arches in Arches National Park formed between the flanks of the Salt Valley and Moab anticlines. (An anticline is a large, ridge shaped fold in the earth’s strata.) These large folds began developing as early as 300 million years ago in the Pennsylvanian period when tectonic pressures caused thick layers of buried salt to migrate into elongated domed structures. Later, a compressional tectonic episode from about 75 to 50 million years ago, called the Laramide orogeny, further deformed these pre-existing structures into highly fractured anticlines. Over time, the joints and fractures in the sandstone units along the flanks of these anticlines were exposed at the surface and eroded into a network of canyons and rock fins which became one of the most ideal environments for arch formation on the planet. Zion National Park, home to Utah’s second largest natural arch, is another example of this type of jointed sandstone environment. Kolob Arch was formed along an extensive regional joint system which was formed by a combination of regional east-west compressional forces followed by a more recent period of extensional forces associated with the pulling apart of the Basin and Range province. 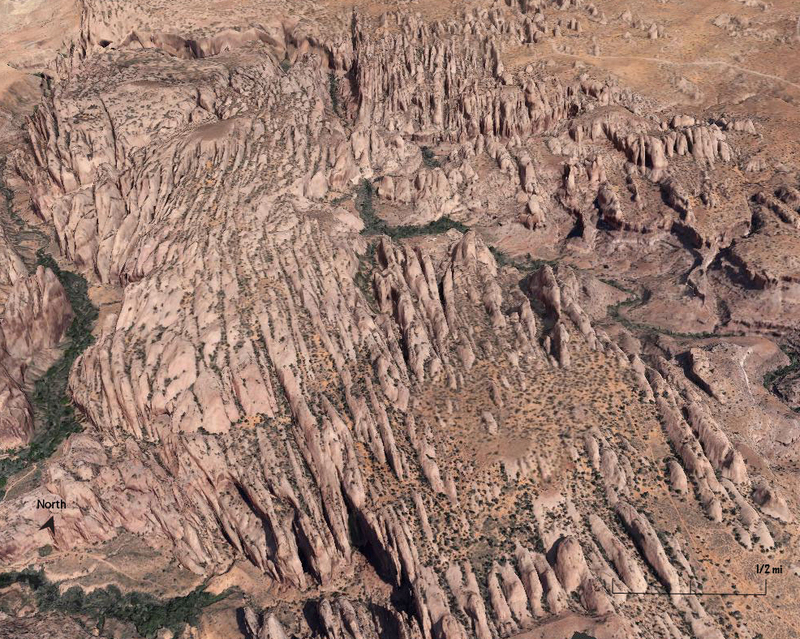 Similar to the area surrounding Arches National Park, the sandstone units in this part of southwest Utah were also fractured by widespread folding during the Late Cretaceous and early Tertiary periods, 75 to 50 million years ago. These joints and compressional faults were then reactivated and enlarged by much more recent extensional forces. These combined events are responsible for the deep framework of NNW to SSE trending joints and fractures which traverse the length of the Park and facilitated the formation of both Kolob Arch and Zion’s iconic non-freestanding “Great Arch” (see fig 2). Joint systems can also form independent of regional fold or fault zones. In many parts of Utah, arches form along joints that develop parallel to the walls of deep canyons. As streams carve canyons into the bedrock, lateral pressure is removed, allowing the bedrock to fracture as it relaxes and expands into the newly created space. The expansion of frozen water which makes its way into these joint systems also serves to greatly accelerate this process. In many of Utah’s sandstone alcoves, “sheeting” of the rock is evidence of this slow release of rock once under great pressure. Rainbow Bridge, near Lake Powell in southern Utah, is an example of an arch formed in an entrenched meander within the Navajo Sandstone. Utah is also unique in its abundance of entrenched river systems which often form spectacular natural bridges. A natural bridge is a subtype of natural arch that is primarily water-formed and often spans a waterway such as a stream. Many of Utah’s natural bridges, such as those found at Natural Bridges National Monument, were formed as the gentle uplift of the Colorado Plateau caused the region’s rivers and streams to become entrenched in deep canyons, while maintaining their original meandering courses. As these entrenched meanders deepened and widened over time, erosion and undercutting of the canyon walls on the outside of meander bends eventually allowed the river to break through, rerouting the river to flow along the shorter course under the newly formed natural bridge. 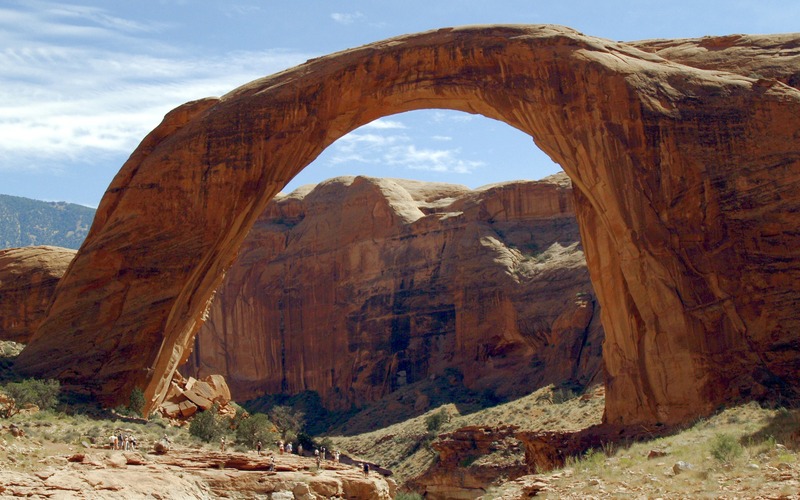 Rainbow Bridge near Lake Powell, Coyote Natural Bridge, and the three large bridges at Natural Bridges National Monument are a few of Utah’s best examples of this type of arch. Ocean waters which cemented Utah’s sandstones, did not always cement the rock evenly. Discontinuities in the cementation of many of Utah’s exposed sandstone layers are another factor which contributes to the abundance of arches in the state. Within the Colorado Plateau, geologic formations such as the Navajo Sandstone and Entrada Sandstone are typically not uniformly cemented together by the calcitic minerals which hold the sand-grains together. The sand in these sandstone units was lithified, or cemented, when large oceans containing dissolved calcitic water covered the dune deposits. As this ocean water percolated into the sand, it precipitated calcium carbonate cement between the grains. 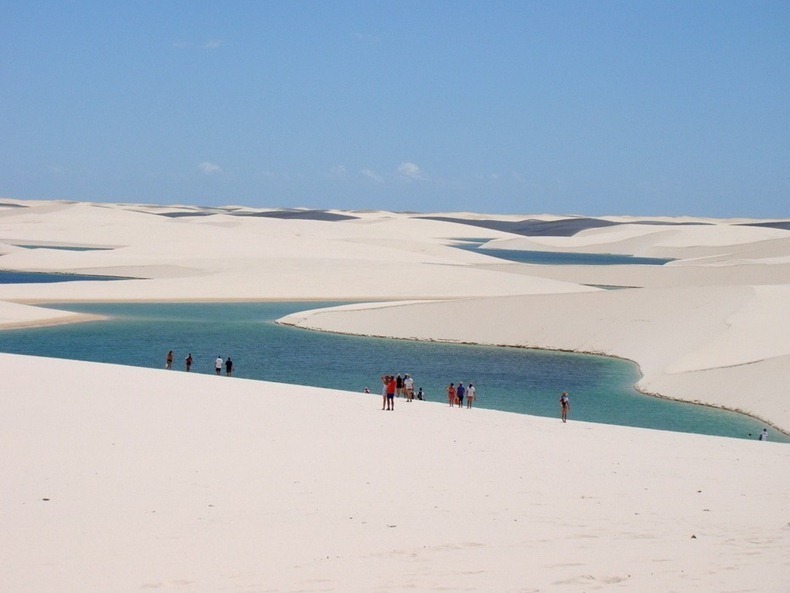 Any pockets of silt, mud, or less-permeable material within the sand which were impervious to groundwater movement often didn’t end up getting cemented as well as the surrounding material. When these areas of poorly cemented sand are exposed to the environment, they quickly erode away forming alcoves, indentations and arches. Even after a sandstone unit is lithified or cemented, the flow of slightly acidic groundwater can also create discontinuities in cementation by dissolving irregular areas of the calcium carbonate cement which hold sandstone grains together. This process can accelerate through time since areas which are poorly cemented often end up being the path of least resistance for additional underground water movement. Over time, large sections of subsurface rock can become decalcified; creating pathways for quick erosion once the rock is exhumed and exposed to the elements. Utah’s Colorado Plateau contains many areas with various combinations of these arch-forming components. The combination of suitable substrate materials, large parallel joint systems, entrenched sandstone canyons and meanders, and cementation irregularities have combined to make Utah home to the densest known concentration of natural arches in the world .